The Cuisinart Stand Mixer is known for delivering best performance with precision. 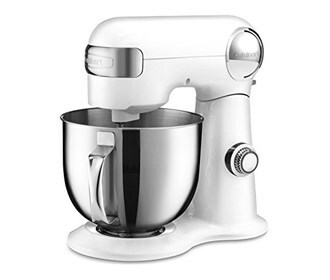 The mixer features a 500-watt motor, die-cast metal construction, and 12 speeds that allow for nuance and excellence in performing a variety of preparation tasks. The unit's tilt-back head allows for easy access to its 5.5-quart mixing bowl, while the included splash guard prevents messy countertops. The mixing bowl and all accessories are dishwasher safe. 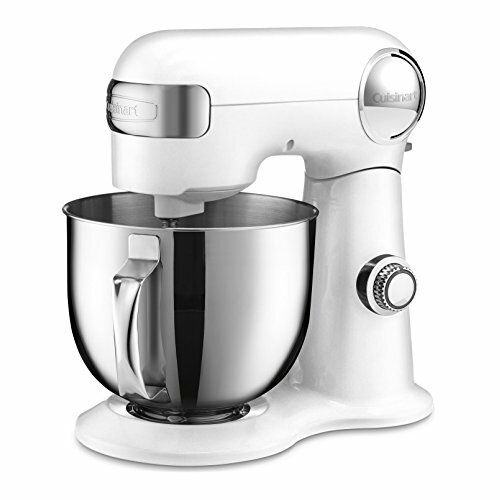 The Cuisinart 5.5qt Stand Mixer White has many exciting features for users of all types. You can extend the lifetime of your Cuisinart 5.5qt Stand Mixer White with the purchase of a FactoryOutletStore Factory Protection Plan. See the Cuisinart 5.5qt Stand Mixer White gallery images above for more product views. The Cuisinart 5.5qt Stand Mixer White is sold as a Brand New Unopened Item.